Prince Khalid Abdulla’s Special Duty finished a nose behind 66/1 chance Jacqueline Quest, trained by Henry Cecil, but after an enquiry into interference she received the race. It was the first time since the 1980 2000 Guineas (when Nureyev was disqualified and Abdulla’s Known Fact was promoted to first) that the result of a Classic has been decided in the stewards’ room and winning trainer Criquette Head-Maarek admitted that the circumstances of her success were far from ideal. “Stephane (Pasquier) said she would have won if it was not for the other horse hanging into her. That filly drifted and drifted but I don’t like to win a race like this,” said Head-Maarek. “I think she proved today that she was the best and in our country she would have kept the race but I never thought they would stand the other filly down in this country. I never thought about objecting, I have never objected in my life. “I suppose the other filly’s connections will be very annoyed and you always like to win a race truly but I’m very happy. There is someone up there looking down, a French God! She is a great filly and has a heart as big as herself. “She had a bad winter and I wasn’t worried that she was beaten in her prep. We had to be 100 per cent today but she was beaten in the prep by two fillies trained in south-west France where the weather had been warmer. Pasquier added: “She was very relaxed behind and showed a superb turn of foot. I deserved to win and she has proved what a good filly she is today. “It is difficult to win a race like this and I would prefer to win properly, this is a different sensation but she definitely deserved it. I’m just happy for my filly and she showed something special today. This was the trainer’s fourth StanJames.com 1000 Guineas success. The French have taken both StanJames.com-sponsored Guineas this year following Makfi’s success in the 2000 Guineas yesterday and this was the first time since 1900 that this has happened and probably ever. Henry Cecil paid tribute to the connections of Special Duty following the demotion of Jacqueline Quest to second place in the StanJames.com 1000 Guineas. Cecil, who would have won his seventh renewal of the Classic if Jacqueline Quest had kept the race, said: “If our filly took Special Duty across the course, then Special Duty deserved to win. Jacqueline Quest ran really well and is improving. Stipendiary Steward William Nunneley, explained the reasoning behind the reversal of the placings by the stewards. He said: “The question we had to consider is whether Special Duty lost her chance of winning due to interference. “We looked at the film and Jacqueline Quest drifted right. They touched and she continued to go across. Tom Queally had his whip in his left hand and Jacqueline Quest continued to drift. “The distance was a nose, which is just a pixel on the photograph. It was not a hard decision for us to make in that it was that small a margin. “We have suspended Tom Queally for three days (May 16 to 18) for careless riding. “We’ll try to get our revenge at Ascot,” a defiant Henry Cecil told owner Noel Martin seconds after the announcement that the finishing positions of the first two fillies home in the StanJames.com 1000 Guineas had been reversed. With Jacqueline Quest having been led in to the winner’s position, Cecil had said as he waited for the result of the stewards’ enquiry: “I didn’t think she’d get the trip and she’s only really just come to hand. It was Noel’s (Martin, owner) decision to run her and I just didn’t think she’d get the mile. I still don’t think she’s quite there yet. She’ll be a lovely filly for the Coronation (Stakes at Royal Ascot). Owner Noel Martin said: “I was convinced she could do it with the way she won last year and ran in the trial. I thought if we held her up a bit maybe she’d get the mile. She’s bred to get the trip. Jacqueline Quest was first past the post with Queally aboard, finishing just a nose ahead of the eventual winner Special Duty. He continued: “It’s obviously disappointing but it’s not a tragedy. There are far worse things going on in the world. You can’t dwell on the past or get bogged down by defeats or bad days. Of course it was a bad day and I’m so sorry for the owner but the filly that won the race is obviously very good and best of luck to them with her. 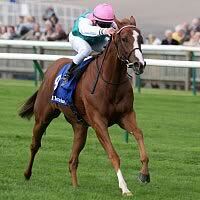 Her trainer Jim Bolger added: “A mile is the bare minimum for her and I wish the race was over nine furlongs. She stays well and could go for the Musidora at York. She could be an Oaks filly.